If you have ever lived in a studio apartment, you are familiar with a 400-500 square foot space. Often times, that space is one large room that is intended to house the bedroom, the living room, and sometimes even the kitchen. Without any sort of division, the space can appear like a room full of furniture. But with some planning, the right tools, and a few design secrets, you can turn that one area into 2, even 3 different rooms. Before you begin constructing these rooms, it’s helpful to make a plan and figure out what’s most visually appealing given the floor plan of your home. Ask yourself the question: when I open my front door, what do I want to see and how do I want to feel? Keep in mind that guests will inevitably be entering your home too, so factor in their first impressions. Most people prefer to keep their bedroom private, so plan for that area to be as out of sight as possible. It feels and looks nice to walk into a home and see the living room first. It evokes feelings of comfort and will put guests at ease to see a common space. Once you have mapped out where you would like each room to be in your space, the next step is to decide how you want to divide the rooms. 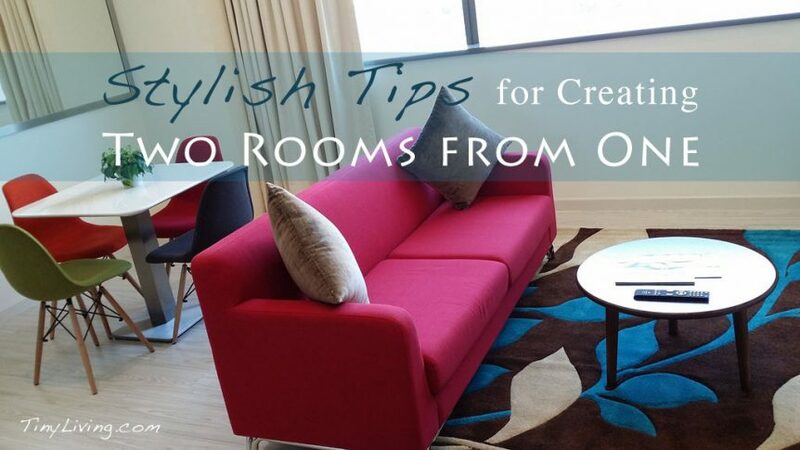 Once you have set your furniture, the simplest way to divide up your space is to use a room divider. There are many options and various materials that you can pick and choose from. Folding Screen: This can be placed anywhere in your studio to distinguish one room from the next and to allow for privacy. A classic wooden divider with sheer paneling creates a simple, yet stylish look. It can separate your bedroom from the living space, the living space from the kitchen, or it can be used to create a distinct entryway. Hanging Fabric: Another option is to install curtains or hanging fabric to divide up your space. While this alternative is less mobile, it will give you the stylistic freedom to pick a colorful or patterned fabric to match your interior. If you want to take your room dividers to the next level there are a variety of multi-purpose solutions to choose from. Shelving units: This is a great way to divide up a room, while also providing storage space. Stack and place the unit between your living space and the kitchen and store cookbooks and other decorative items on the shelves. Ikea has a variety of shelving units that come in different colors, styles, and price points, with the option of including inserts to help keep smaller items organized and out of sight. Built-in Bookcase Headboard: This is one of my favorite multipurpose room dividers, it’s stylish and innovative and it looks like it was built to be part of the space. I first discovered it while reading about a small space renovation on the blog Apartment Therapy. The built-in cabinets are ceiling height and divide the space that separates the sleeping area from the entryway, all while acting like a headboard for the bed. The cabinets were customized using storage units from Ikea to make them look like real built-ins. While adding room dividers is a great way to separate a large space, bringing in another piece of furniture might not be the best solution for a small space. If you are worried about clutter, consider building up. For example, a lofted bed is a great alternative to having your bed on the ground. It will give you that extra space underneath for a desk or office, while adding some height at the same time. You can use that height to divide your space, such as floating a lofted bed in the middle of a room to separate the living area from the bedroom. Imagine a bed, a desk and a room divider, all in one. There are many ways to break up one large space without adding physical dividers. Layout: First, think critically about the layout of your space and where you place your furniture. If you float your couch in the middle of the space, it creates a natural divider. I was once lucky enough to live in a studio apartment with South facing windows and positioned my couch so that I could sit and look out the windows. Not only was that an enjoyable spot to drink my afternoon coffee, but it also broke up the room and gave it a defined space. Add an area rug: Do you want your living room to feel more like, well, a living room? Try adding a large area rug. This will not only give your space some style, but it provides visual boundaries and will make it feel like its very own room. Color Consistency: While you are in decorating mode, consider keeping your color palette neutral. I’m not saying stick with all white or beige, but do choose one color and stick with it. If you love yellow, use that color as your accent, and only that color. It will give your space an illusion of calm and cohesion. The more colors you incorporate into a space, the more chaotic it can feel.